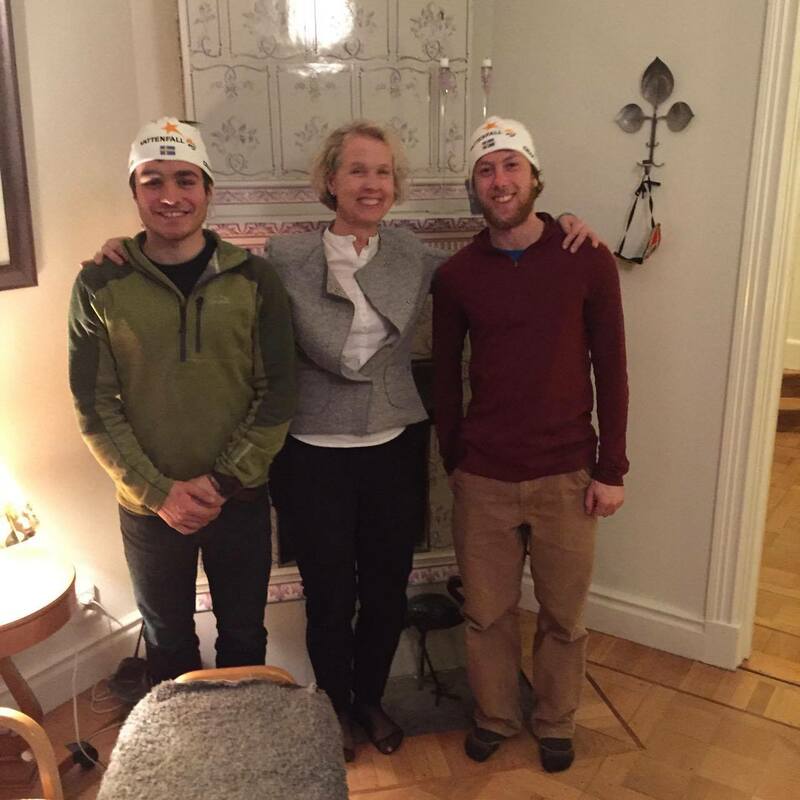 New Vattenfall Swedish Ski Team hats! On Thursday we took the the train to Mora to explore before the Vasaloppet. 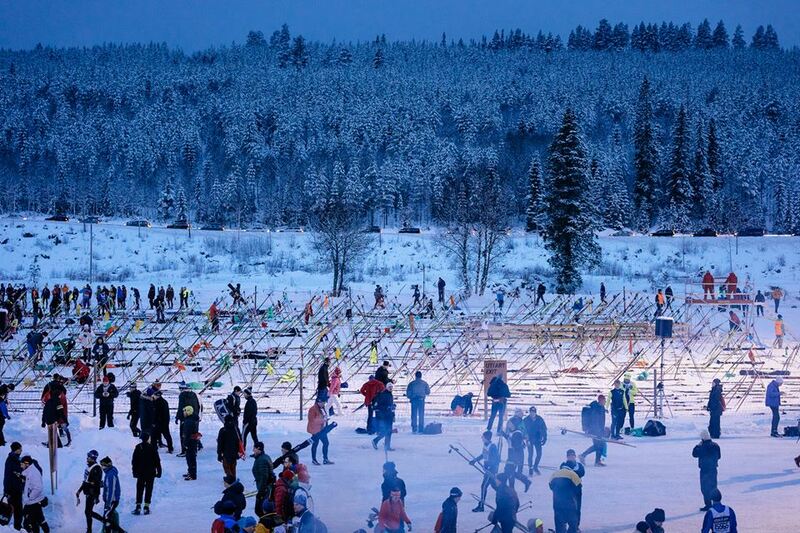 Mora eat sleeps and breathes the Vasaloppet in the week leading up to the main event and there are all sorts of other races that go on. All in all over 66,000 people participated in Vasa races throughout the week! Main street was covered in snow for the finishing stretch, huge tents had been set up for restaurants, registration and vendors and music was playing all of the time. In the days leading up to the race we were able to explore the course, buy a lot of cool gear and try to rest up for the race. On Saturday both Jada (Tyler's girlfriend) and Christine joined us for the weekend festivities. Jada and Christine both went to Bowdoin as well. Christine is studying for her Masters in Lund, Sweden and Jada has come to join the adventure for the next week! We woke up at 3:00 AM on Sunday morning to catch a bus from Mora to Sälen, where the Vasaloppet starts. Although we went to bed at a reasonable time the night before, we figured there was a chance we would be racing for a longer time than we had slept. That’s not the best race preparation. Thousands of others also took the early buses, many already in their ski boots and bibs. We could tell the race would be competitive because elbows were thrown as we jostled for position to get on one of the many buses. The stadium was already buzzing, and probably had been for a few hours, when we arrived at 6:00AM. We had used previous results from the winter to move our starting position to the first starting section, right behind the elite skiers, so there were only about 400 other skiers in our pen. But the zones behind us (2-10) were increasingly large and skiers apparently got to the start as early as 4 or 5 AM to claim a spot. When we arrived, people were waiting in hour-long lines to enter their respective start areas. The lines to the porta potties were equally interminable. 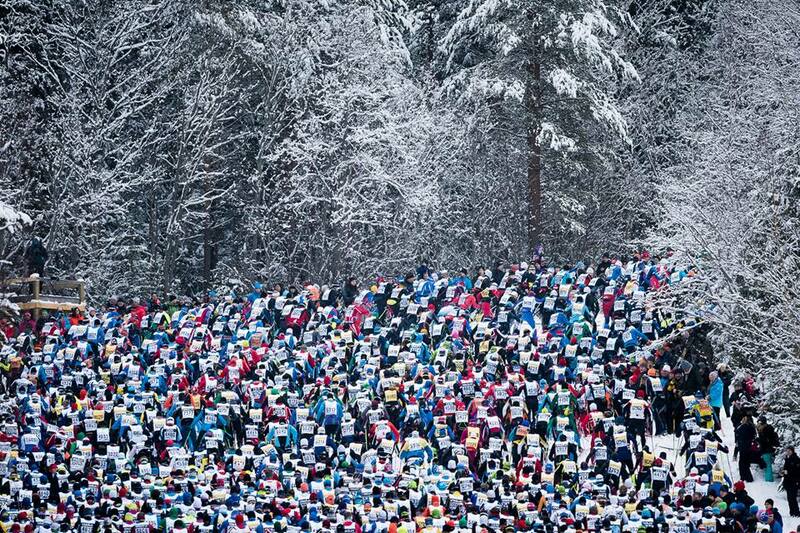 Finally, at 8:00AM, the banners in front of the elite skiers rose and the race started. We were near the front and began moving instantly, but the mass 15,000 skiers behind us mostly stood still, waiting for some space to open up before them. 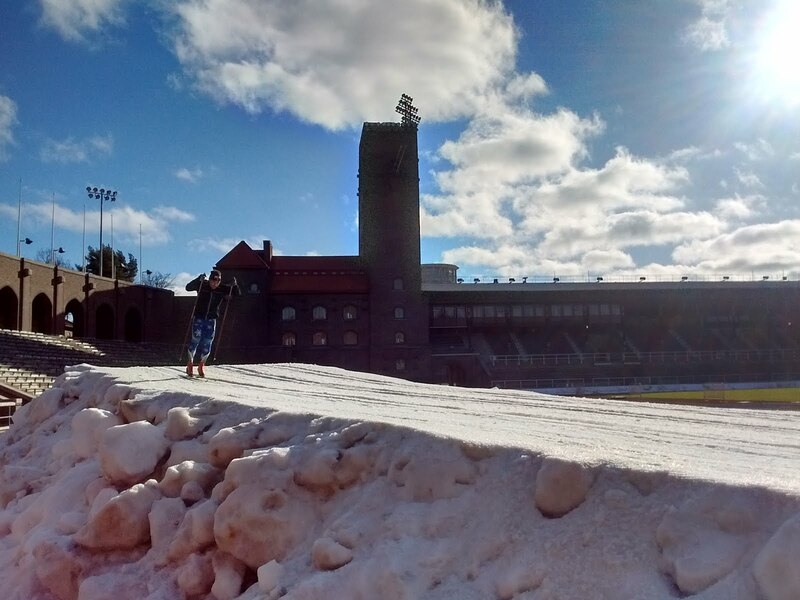 The Vasaloppet is very flat, but there is a 2km hill with 200 meters of vertical gain right at the beginning of the course. 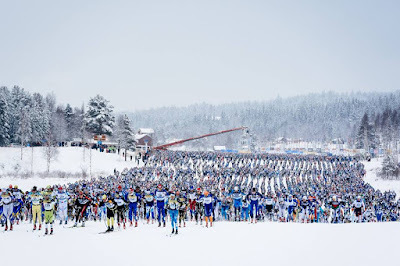 Many top marathon skiers are now choosing to completely double pole classic races, meaning they do not put kick wax on their skis and just use their arms and upper body (more or less) to ski the course. This decision weighs the tradeoff between more slippery skis (skis that don’t have kick wax) and more efficient uphill skiing (traditional classic striding). Recently, most of the winners of races have chosen to double pole, so it’s becoming a popular fad and we joined in. 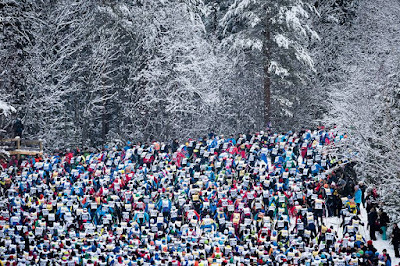 This decision made the first hill hurt, but the mass of skiers, even near the front where we were, created a large bottleneck and we were able to ski slowly and conserve energy. Behind us, again, most skiers stood still and it took some in the very back over 2 hours to ski the first 5 kilometers. 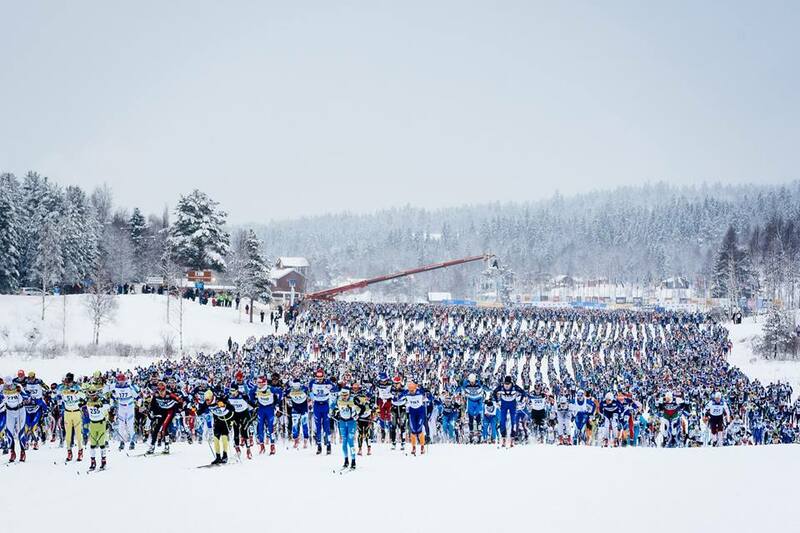 In a flat, 90 kilometer race, our main focuses were fueling well and skiing in a group to take advantage of the draft. We didn’t perfect the fueling, but there were enough aid stations and we carried enough gels (Jackson carried 900 calories of GU, gross) with us to feel strong for the majority of the race. Skiing in a group was easy because hundreds of skiers stretched out in front of us and thousands followed behind. Over 90 kilometers, we were never alone. It is pretty easy to shut off your brain as the kilometers tick by, but both of us remember painfully hitting a wall about five kilometers from the finish. 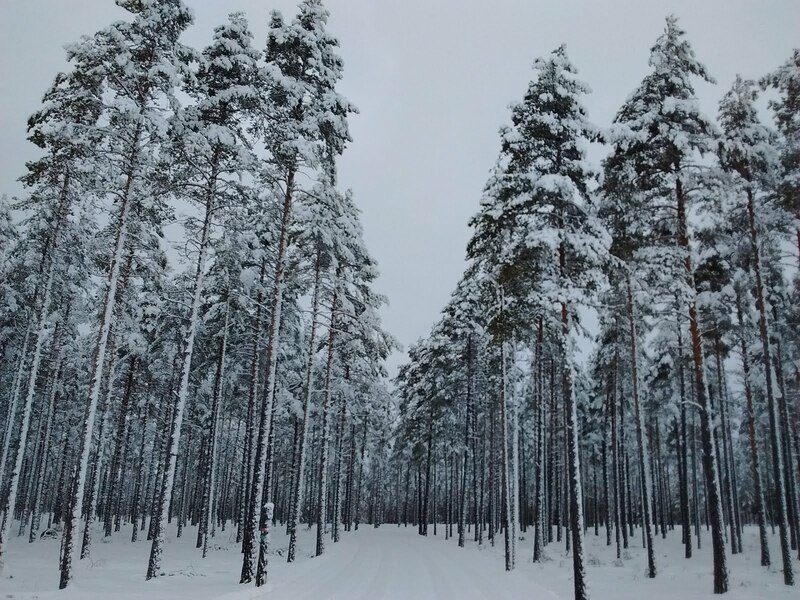 Those may be the hardest five kilometers we’ve ever skied. Fortunately, fans line the course from about two kilometers to the end, so there is a lot of external motivation to finish well. In the end, Tyler finished in 321st in a time of 4:35:25 and Jackson finished in 340th in a time of 4:37:11, possibly unable to remember his name but his arms still raised in celebration. We were lucky to have Jada and Christine cheering for us at several of the aid stations along the course. 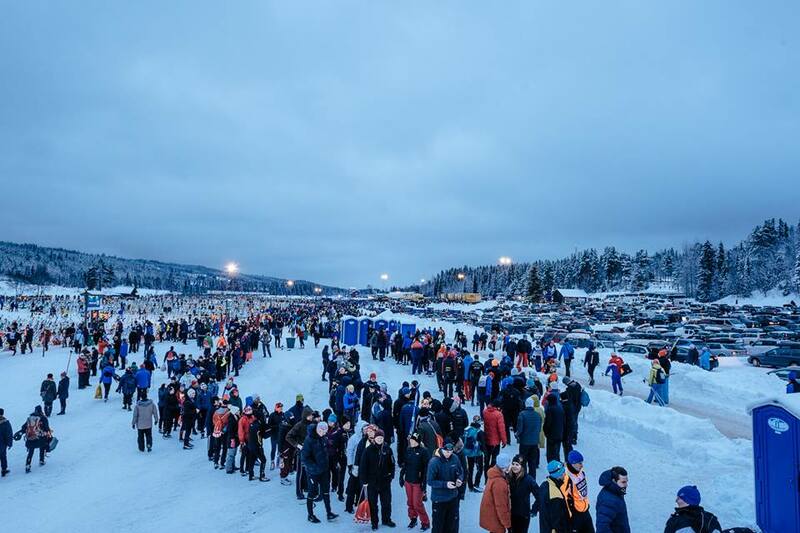 Despite the Vasaloppet preparing of 7,000 liters of blueberry soup for participants, we didn’t try any. Two days later, our arms are still sore but we’ve regained full cognitive abilities (we think). Jackson is now in Zürich, where he will meet his family before going to St. Moritz for the Engadin and Tyler and Jada are visiting Östersund, Sweden before joining everyone in Switzerland. Congratulations to your phenomenal race!! You are both welcome to join our relay teams any time! Styrbord (starboard) full speed ahead or Babord (port side) dead slow. It´s free of choice. There is worse "things" to ski!